Finding practical solutions to community-based challenges is at the heart of a new three-year partnership between Green County and the UniverCity Year program at the University of Wisconsin–Madison that will kick off Aug. 21 with a gala event at the Monroe High School Performing Arts Center. Developed with the Wisconsin Idea in mind, UniverCity Year brings together faculty, students and members of Wisconsin communities to address local challenges through engagement, university research and state-of-the-art technology. In Green County, participants will work together to reexamine long-standing practices, ask tough questions, engage residents and ignite sustainable growth through 23 community-based projects, from assessing quality food and transportation to developing farm cooperatives and ATV trails. “Green County makes a great partner because we’re getting to take the model on the road. They are a mix between an urban and a rural county, which allows our faculty and staff an opportunity to work on unique issues,” said Gavin Luter, director of the UniverCity Alliance and the UniverCity Year program. During the upcoming academic year, UW–Madison faculty will be matched with a community project that fits their expertise and teaching focus. Throughout the year, professors will incorporate the selected project goals into their courses, working with students and community members to develop a plan of action, which will be implemented beginning in late 2019. The partnership will continue through 2020. Green County is the third Wisconsin community to participate in UniverCity Year, joining the city of Monona and Dane County. Successful projects completed or underway addressed housing, solar energy and community health, among other topics. 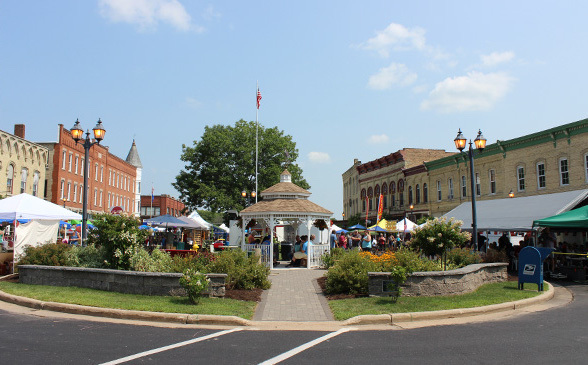 Green County leaders hope to share in that success as they build on their rich agricultural history, strong community-based businesses and small-town atmosphere. Carper will serve as the community lead on several of the projects, matched with faculty and students who will work with her to develop a plan for a quality of life analysis, housing projects and more. Nearly 20 other Green County community members have also joined the program as project leads, working with a number of faculty and classrooms throughout the fall 2018 and spring 2019 semesters. Activities: The evening will begin with a work session for community leaders directly involved in UniverCity Year projects. At 4:30 p.m., UniverCity will host a festive networking session for all with light hors d’oeuvres and a special appearance from Bucky Badger and the Wisconsin Foundation and Alumni Association’s vintage truck packed with famous Babcock Hall ice cream. At 5:30 p.m., futurist Rebecca Ryan will get participants thinking about innovative solutions to local issues, with an engaging and energizing speech.